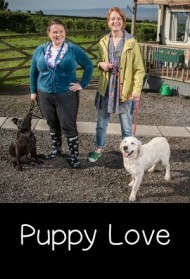 Puppy Love is a comedy series about love, dogs and the love of dogs. Naomi's marriage is on the rocks and she has to deal with subsidence in her home and difficult Polish builders demanding money. Things become even worse after Charlie, her Labrador Retriever goes missing. Nana V receives a visit from a fire safety officer called Damon Peachey with whom she shares an online past. She and Tony find themselves intrigued by the idea of a fire starting in the caravan, and the subsequent insurance claim. Naomi gets Nana V to help her track Charlie down, and the two women form an unexpected bond. Nana V organises some potholing work for her long-lost brother Fatdraic. Fatdraic arrives at her yard with a present in tow for Eron, a tiny pony, failing to work out that he’s now far too grown-up for it. Jepherson Denomer, a trustee from the charity Naomi works for, Future’Z, is coming on a fact-finding visit. He shows up in his vintage Daimler, Naomi explains to him what’s been achieved in the local area. Naomi wants to impress the commodore of the local yachting club called Dave Wilson. In an effort to impress she steps in to join his team, competing in the West Kirby Sailing Club’s Wilson Trophy. Things don’t go to plan though after she invites Dave, and her friends, to an elaborate dinner party. Nana V and Gerry decide to run a Canine Responsibility Awareness Community Day, as Nana V leads a special hazards class for new puppies. After dog trainer Nana V is called out to rescue a dangerous dog, she manages to gain the attention of local man Alexander Moss, who is having a problem with his dog, Toffee.